UP Haj Committee Qurrah Lottery Result 2019 will uploaded on official site uphajcommittee.com. 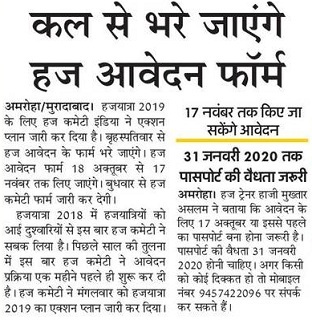 UP Haj Committee waiting list 2019 is for those selected candidates of India Citizen as per 15 November date Haj committee of India has granted for Haj 2019 from lucknow. It is advice that for those who were in doubt of Waiting List Numbers not given Provisional approval Status and also to those not selected in Qurrah they are advice visit directly from Uttar Pradesh haj committee office and if you are from other states such as telangana, Madhya Pradesh, Hyderabad, Aligarh, Mumbai, Delhi , Pune, Bangalore, Tamilnadu, Andhra Pradesh, Delhi, Haryana, Jammu Kashmir, Jharkhand Karnataka just go for help line numbers and concerned In charge names. 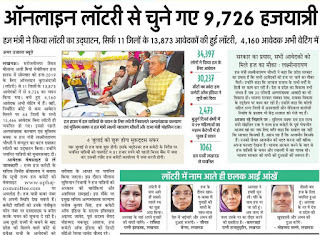 Haj Online Lottery Result 2019: From 64 district 9726 Haj Yatri has been selected from Uttar Pradesh. You may see below that Haj Alpsankhyak Kalyan Mantri Mohsin Raja and Haj Mantri Lakshami Narayan Chaudhari in augrated the Online Computer Result by pushing button. Safar Starting from 4 July 2019. In Waiting List: 4160 applicants. 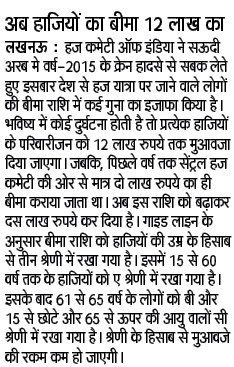 Haj Lottery in UP: Lottery result of 27665 Ajmeen with name list will be publicly announced from 14 January. Haj applicant are advice to visit haj house in Uttar Pradesh for more details. 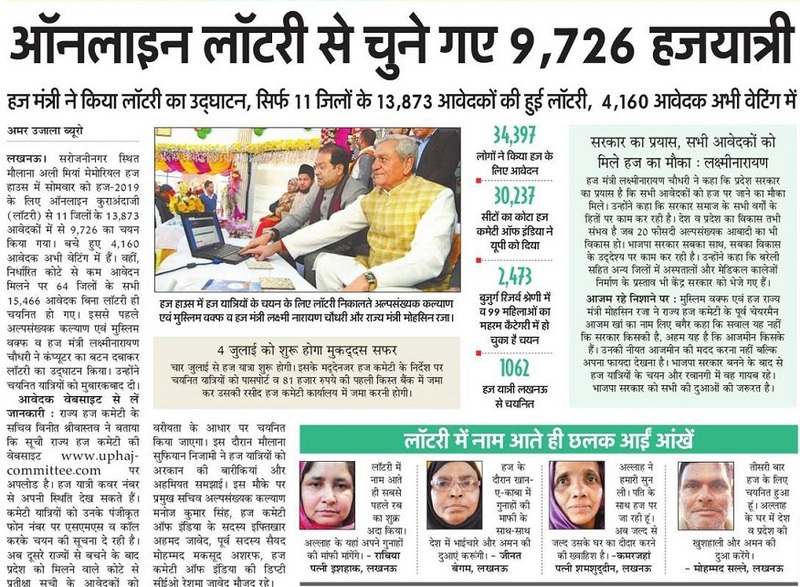 This is latest news of 14 January 2019. 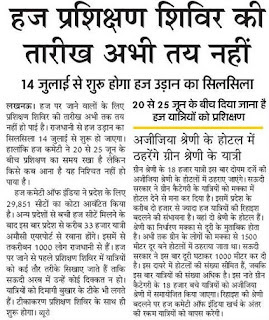 UP Haj Lottery Date 2018: In January through lottery result Haj applicant will be choosen from 34,000 Number list maked by UP Government. In some district of Uttar Pradesh Haj candidates liked to sent their Haj Application Form from India Posts Office ordinary posts method. 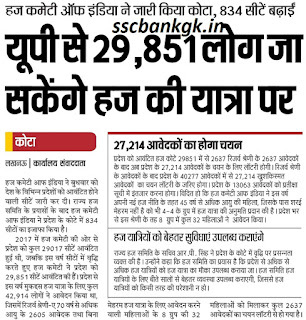 It is expected 35,000 More public get chance in it. 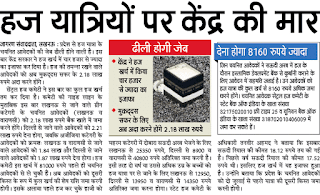 Haj Quota of UP is 29,851. Hajj Passport Latest News: Before 17 November Haj passport will be released. Haj committee directed all officer to check haj pass issued on 31st January 2020. Applicant have to renew their haj passport from office of haj. Physically Handicapped HAJ: Viklang jan can also go for haj. this news id updated on 2 November 2018. Haj Form 2019: Latest News of 17 October by Mukhtar Abbas Naqvi said in meeting to start Haj Application Form from 18 October 2018. For More details of How to apply Haj 2019 form kindly check below links. Online Form: 18 October 2018. Closing Date to fill application: 19 November 2018. Haj committee has made action plan to declared time table/schedule of Haj 2019. Document in Haj 2019: Candidates passport should be valid up to 31 January 2020. 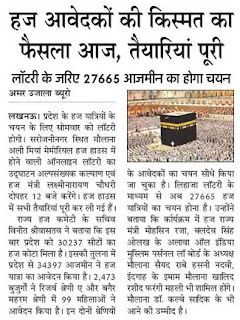 Helpline Number of Haj 2019: 9457422096. Haj House Lucknow 2018:- Haj House Online reporting of Yatri can be filled before 2 Days of Haj Flight. Candidates get Name list from www.Hajcommittee.org. 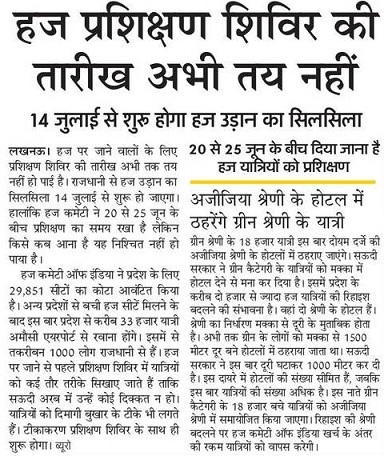 Haj Flight Date 2018:- From 14 July 2018 Haj First flight take of from Lucknow Centers. Haj Training Date 2018:- To give haj applicant training for how to live, adjust in Mekkah Madina training session organized from 20 to 25 June 2018. But who will come in training and if any message given to name list and numbrize it is difficult to say. Aziziya Category Hotel:- In Saudi Arabia green category people will sit in aziziya hotel. Now Mekkah Medina distance come closer to 1,000 meters. Haj Lottery Result 2018:- Latest News 31 January is Rs 81,000 Amount should be paid before 12 February. On Wednesday Haj Department extended the date. 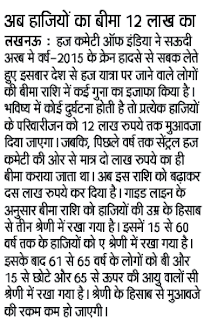 Haj Lottery Draw starting from 22 January in all minority department of Uttar Pradesh. To know more details you may check 21 January news given below. 1st Amount Payment Last Date: 12 February. 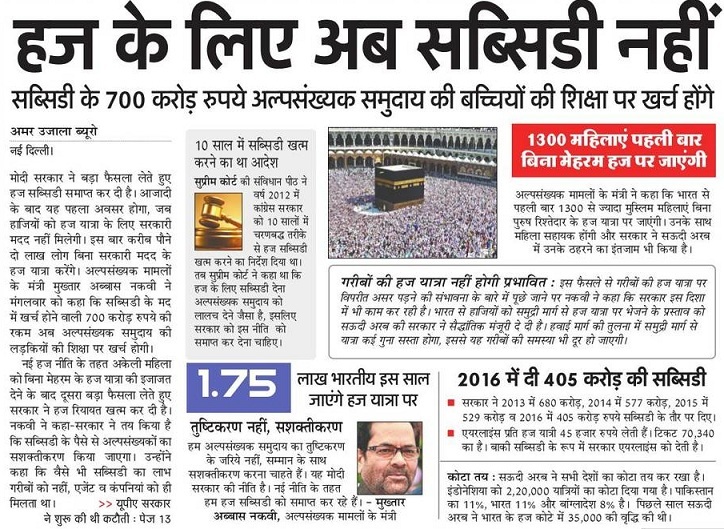 Haj Subsidy 2018: Modi Government has given decision after Freedom to stop Haj Subsidy and to use it in welfare of Minority Women. 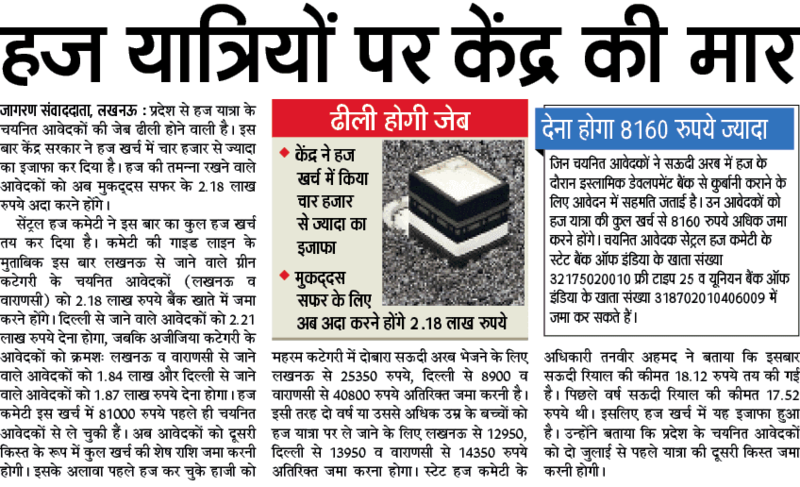 But Haj Subsidy not fully cot for lower income group.. Government is also making policy to give direct benefit. Haj Committee of India Pilgrim List 2018: Latest News 12 Jan 2018 Haj Committee of India Released the Kota of Seats according to state wise. 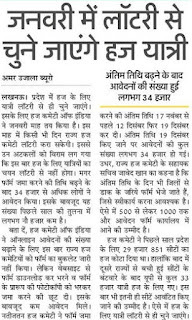 Good News is also for Uttar Pradesh is 834 more seats given to Haj applicant of UP. UP Haj 2018 Online Form Latest News: Haj Committee Uttar Pradesh Lottery with name list published on 10 to 15 January. 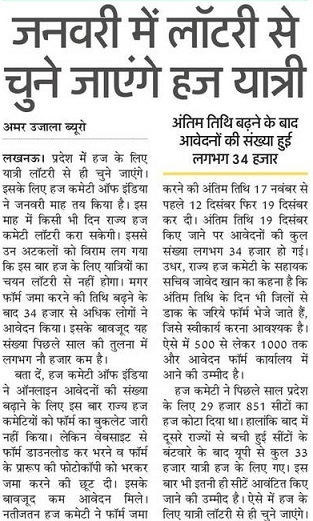 State Haj Committee selected 2637 candidates without lottery, 22 Childrens and 42918 Applicant will go haj this year As per Uttar Pradesh Government. Starting Date for Online application is 15 November 2017. 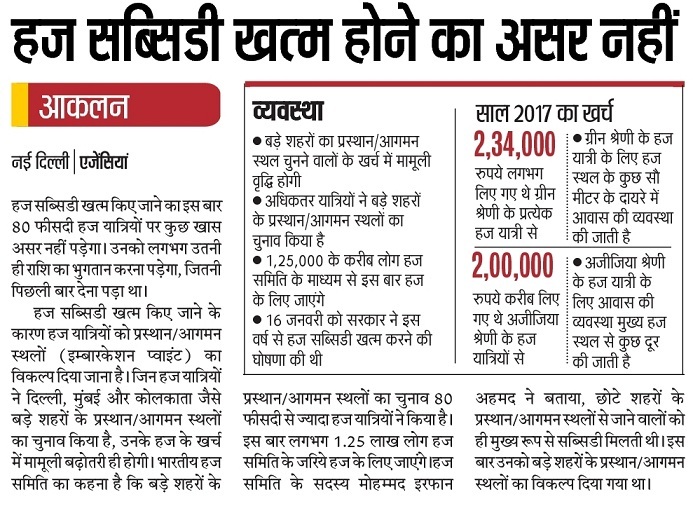 Haj 2018 last date in UP is 24 January 2018. Hajj Cost Per Person From India: Latest update is Haj Yatra will be costly and those people who have applied under green category will give Rs 17950 and for Ajijiya category have to pay Rs 18450 Before the Last date 19th June 2018. Those people who have given 1st amount and their 2nd installment amount should be paid before closing date on 19th June 2018. 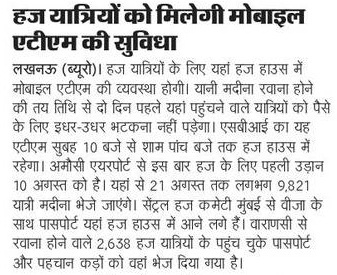 UP hajj fees India: 29,000 Haj candidates to submit fees 81,000 before 5 April 2018 and last date to submit Passport and Medical certificate is 13th April 2018.Before Submitting UP Haj Fees you should have with pay in slip, reference number and cover number. UP Haj Waiting List 2018: From July Haj Committee Uttar Pradesh Updated waiting list. Committee said before 48 Hour flight take off Yatri should visit Haj House. Haj Flight Scheduled first flight date to go haj is 24 July 2018. Bhopal – 462 001, Madhya Pradesh. Poducherry / Pondicherry / Puducherry — 605 001. Address : Haji Mohammed Ayub Khan, Chairman, Orissa State Haj Committee, Old Secretariat, Cuttak – 753 001, Orissa. Address : Mr. Amin Pathan Chairman, Rajasthan State Haj Committee Home (GR-III) Dept. GovernmentSecretariat, Jaipur – 302 005,Rajasthan. Contact Number : Mobile : 9829035354, Telephone :0141 – 2227246. Note: The ‘Arafat day’ is scheduled to take place on ( Tentative date)31st August 2017. Address :The Chairman,Daman & Diu State Haj Committee,Administration of Daman & Diu Officeof the Collector, Daman – 396 220, Daman Diu. Address : Mr. Mohammed Amin Shah,Chairman,Manipur State Haj Committee,Old Guwahati High Court Complex,North A. O. C Imphal – 795 001, Manipur. Address :Mohd. Ishraq Khan, M.L.A., Chairman, Delhi State Haj Committee, Haj Manzil, Turkman Gate, Asaf Ali Road, New Delhi – 110 002. R/o. : 455, Gali No. 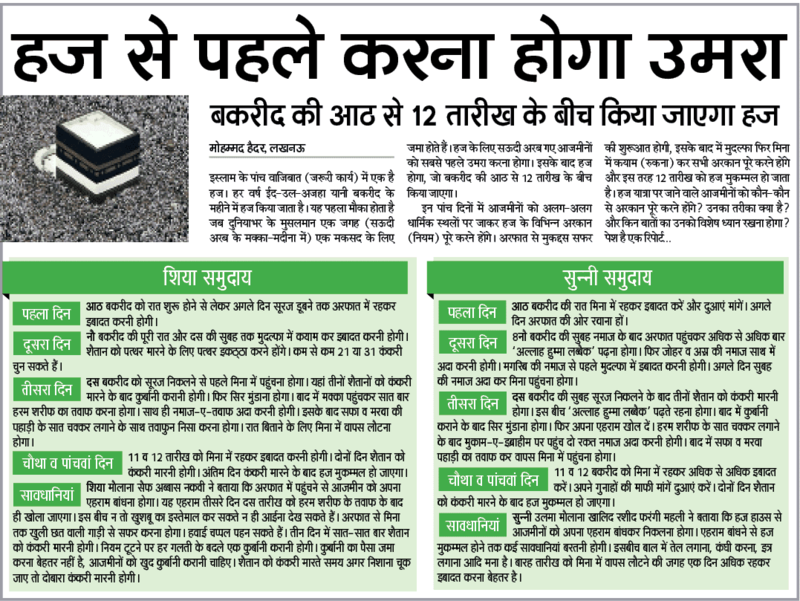 : 19, Main Road, Jafrabad, Delhi – 110 053. Address : The Chairman, U. T. Chandigarh, Room No. : 23, 1st Floor, Estate Office Building, Sector – 17, Chandigarh – 160 001. Address :Haji Rao Sher Mohammed, Chairman, Uttrakhand State Haj Committee, Uttarakhand Haj House, Piran Kaliyar, Roorkee, Haridwar – 247 667, Uttarakhand. Contact Number : Mobile : 9412979200, Telephone : 01332 -297520. 20. Andhra Pradesh Haj Qurrah Result 2017 get from apstatehajcommittee.com for AP State Haj Committee Latest News. Address :Mr. Gulam Hussain Qasim Jadwet,Chairman, (A & N)Island,Dte. of Social Welfare Building, 2nd Floor,Room No. : 309 / 310, Goalghar Junction, P. B. No. : 148, HPO, Port Blair – 744 101, Andaman & Nicobar. Address : Mr. Syed Saifuddin, Chairman, Chattisgarh State Haj Committee, Off. :- Mukharjee Bada Byron Bazar, Raipur – 492 001, Chattisgarh. Res. :- Near Railway Crossing, Ganesh Nagar, Bisalpur – 495 001, Chattisgarh. Address : Mr. Shaikh Jina,Chairman, Goa State Haj Committee, Shop No. : 20 / 21, OSIA Mall, Near KTC Bus Stand, Margao, Goa. Address : Mr. Dildar Ali Bhat, Chairman, Himachal Pradesh State Haj Committee, Home C Department, 4th Floor, Room No. : 405, Armsadle Bldg , Secretariat, Shimla – 170 002, Himachal Pradesh. Address : Mr. Munish Ahmed Ansari, Chairman, Haryana State Haj Committee, Room No. : 50, 6th Floor, Haryana Civil Secretariat, Chandigarh – 160 001. Address :Haji Hussain Ansari, Chairman,Jharkhand State Haj Committee, Audrey House,Kanke Road, Ranchi – 834 004, Jharkhand. Contact Number : Mobile : 9431157723, Telephone :0651 -2283100 / 2400890. Address : Mr. K. Hamza Koya Faiza, Chairman, Union Territory of Lakshadweep State Haj Committee, Indra Gandhi Road, Kavarati Island, Kavarati – 682 555, Lakshadweep. UP Haj Online Lottery Result 2017: Probably Haj Applicant Lucky Box open on 21st March 2017. But in the period before Lottery Result declaration total 9395 candidates have beed selected for Haj. According To haj committee of India, Mumbai guidelines published on 21.03.2017 in that haj committee will delcared the selected candidates list. Below are giving candidates number who have applied and selected from from up district. 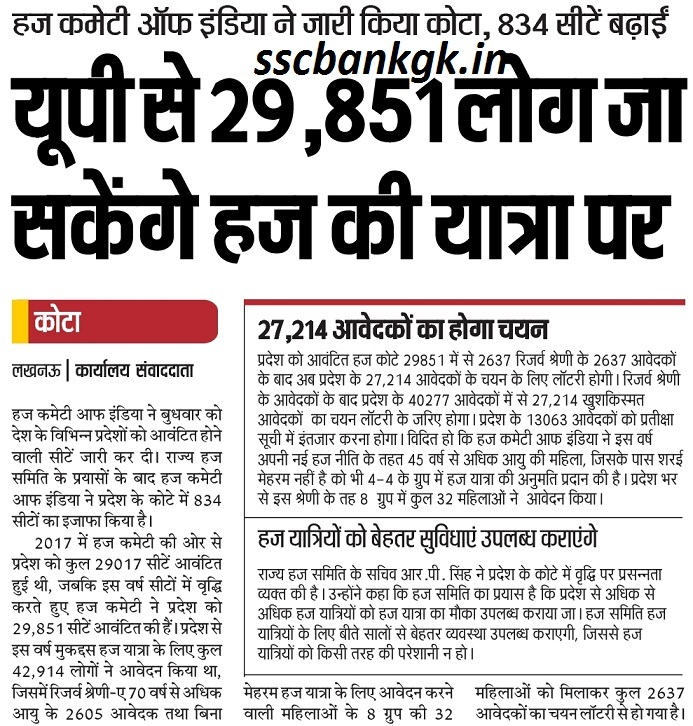 Note: Total 19622 Lottery Result declared today which is said by Personal Law Board. Haj Ajmin Lottery Result 2017: 45000 haj avedak Lottery result displayed on 21 March 2017. 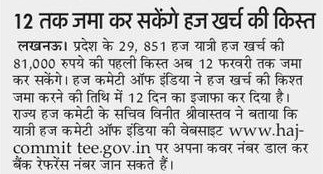 This grand year 51356 Ajmin have applied for Haj in which 5700 candidates already selected and left candidates 45656 ajmeenn result on 21 March 2017 it will be online. Haj Qurrah Lottery Result 2017: For Haj Pilgrimage Good News for those who are waiting for UP Haj Yatra Qurrah News and Lottery Result going to be displayed from 14 to 21 March 2017.In Next week Period Central Government will announce haj result 2017. Below read Notification. We will Soon Update all Type of News regarding Provisional Select Status of haj people in Saudi Arabia. We will soon give name of hajj 2017 qurrah waiting list by name, pilgrim name and their new cover number 2017 and Old 2012, 2013, 2014.Haj in Makkah Madina 2017 in Saudi Arabia the district wise selected list and cancelled candidates as per application form of Khadim-ul-Hujjaj. UP Qurrah Date 2016 It would take place between 16th March to 23rd March, 2016. Ministry of haj committee cover number type in demo is UPF-2443-2-0. up haj committee 2016 the process of haj 2016 latest news comes as an haj committee of India called hoj in short form Hcoi was commences on 14 January 2017.To know more Makkah and Madina they give booklets containing guidlines containing haj application forms HAF which available in the free of costs. applicants may read the syllabus on official website hajcommitee.gov.in. Address: Khan, Chairman, Uttar Pradesh State Haj Committee, 10-A, Vidhan Bhawan Marg, Lucknow – 226 001, Uttar Pradesh. Kya aaj bhi koi haj se related lottery niklni h..??? Jo Haj applicant waiting list me h unka Clearance kab tak ho jayega Pls koi Saheb btay? Sir hamri wahting 1886 he kiy yhe asaqti he kiy ? SIR JI HAMNE GREEN ME FORM BHARA HAI NUMBER Waiting ME HAI 500 KE KARIB KYA NUMBER LAG JAENGA. Sir hamne green me form bhara hai waiting' 500 hai.kya number confirms ho jayenga.?? Online fees to aaj ki date me bhi jma ho rahi hai bhai. Waiting list ke bare me agar kuch malum ho kise bhai ko to btaye. Sir my waiting list no. for Hajj is 19015. Ravi sir jinone geen me form bhara hai unke waiting list ka kya huwa hai.abhi tak 500 logo ki bhi waiting bhi clear nahi hu vi hai. Confirm ho rahi hai. green ki kyu nahi. Kiy how koi mujhe bat sqta he ki wahting or kuhlegi kiy? 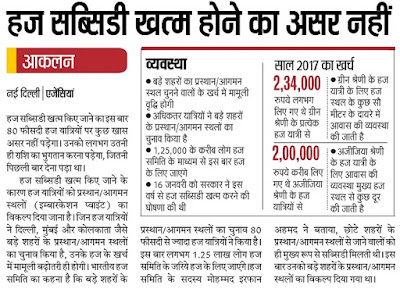 haj volunteer 2017 k liye kab contact kare or kisse contact karna hai mai khadimul hujjaj kiram k liye haj 2017 k apply karna chahta hu. My waiting list is 1376 ye clear ho jaygi kya...??? My cover no is upf-127-5-0 it is waiting list 1376.... Ye confirm ho jayga??? My cover no is upf-127-5-0 it is in waiting list 1376 ye confirm ho jayga???? Where is the Qurrah list of Madhya Pradesh ?